Get started right away—HP QuickSync is preinstalled on HP Mini netbooks along with a copy of the software, so you can install it on your main PC or another device and get syncing in a few simple steps. To install the software on more than two devices, you’ll need to purchase additional software licenses for each subsequent device you’d like to sync. 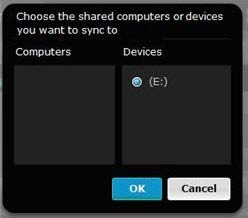 Automatically sync content—Save time by easily setting up HP QuickSync to update your syncable devices anytime new content is added. Get peace of mind—Feel confident knowing your content is up-to-date and you can access it from multiple devices1 everywhere you need to. Work now, sync later—Create or update content on the go and sync back to your main PC wirelessly2 when you get home. Gone are the days when you had to have your laptop with you to show off your vacation photos. Now, just grab your synced netbook and start the show. 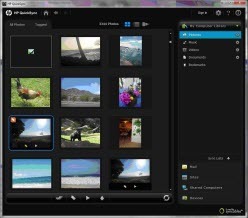 With HP QuickSync, you can set up your devices to sync new content automatically, then access it where and when you need it. 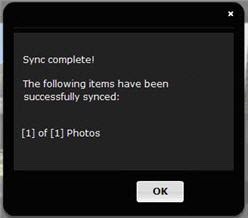 Sync files and documents—Files and documents can be synced to multiple computers on a network, so you can be sure you’re working off the latest file. With the help of HP QuickSync on your HP Mini netbook, it’s easy to keep your digital life in sync no matter where you go. 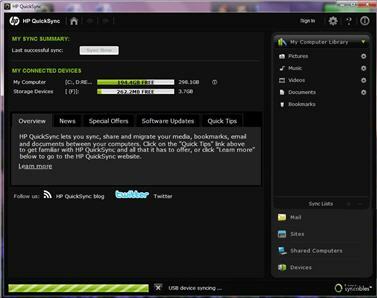 1 To use HP QuickSync, each device must have HP QuickSync software installed and all devices need to be on the same network. 2 Internet access is required and sold separately.